Please keep your butterfly and moth records and send them in to the relevant Recorder as soon as convenient. If you collect a lot of records send them in monthly or by arrangement with the Recorder. Every record counts, even the more common species as they can be valuable indicators of change. If you could submit your records on a spreadsheet, that would be really useful (though not essential). VC97 West Inverness-shire Tom Prescott, Mill House, Mill Road, Kingussie, Inverness-shire, PH21 1LF. VC104 North Ebudes - Small Isles Jessie Mackay, Fionchra, Carsfad, St John's Town of Dalry, Castle Douglas, DG7 3SU. email: mackay@entomology.freeserve.co.uk, Tel: 01644 430248. VC110 Outer Hebrides Steve Duffield, 5 Drimsdale, South Uist, Western Isles, HS8 5RT. email: steveduffield@hebrides.net, Tel: 01870 620241 (h), 07867 555971 (m). VC111 Orkney Islands Sydney Gauld, Quoyberstane, Work Road, St Ola, Kirkwall, Orkney, KW15 1UF. Vice-County recorders may query records from recorders, particularly inexperienced trappers. Please do not be offended by this. It is very important that records on the central database are accurate and we are anxious to avoid unverified records of certain difficult species being entered. Many species are common and easy to identify, but many can only be identified by genitalia examination. Between these two extremes are moths whose identification may be tricky, and records from experienced observers may be accepted more easily than those from the new moth trapper. With this in mind we have provided a checklist (pdf file) showing the level of record required for each species of macro moth in the Highlands and giving an indication of which records are likely to be queried. Please send your moth records to the appropriate Vice-County Moth Recorder, whose contact details can be found below. 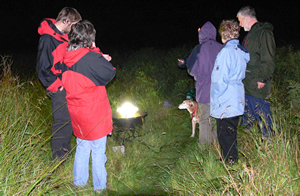 Please visit the Moths Count website for more information about the National Moth Recording Scheme (opens in new window). VC 94 Banffshire Roy Leverton, Whitewells, Ordiquhill, Cornhill, Banffshire, AB45 2HS. VC 95 Moray Michael Taylor, Allasdale, Kinchurdy Road, Boat of Garten, Inverness-shire, PH24 3BP. email: mst.taylor@btinternet.com, Tel 01479 831060. VC 96 East Inverness-shire Michael Taylor, Allasdale, Kinchurdy Road, Boat of Garten, Inverness-shire, PH24 3BP. VC 97 West Inverness-shire Tom Prescott, Mill House, Mill Road, Kingussie, Inverness-shire, PH21 1LF. VC 104 North Ebudes Skye: Dr Keith Sadler, Seascape, 2 Portnalong, Carbost, Isle of Skye, IV47 8SL. Small Isles: Jessie Mackay, Fionchra, Carsfad, St John's Town of Dalry, Castle Douglas, DG7 3SU. email: mackay@entomology.freeserve.co.uk, Tel: 01644 430248. Neil Money, Heathfield House, Dunnet, Thurso, Caithness, KW14 8XP. VC 110 Outer Hebrides Steve Duffield, 5 Drimsdale, South Uist, Western Isles, HS8 5RT. VC 111 Orkney Islands Sydney Gauld, Quoyberstane, Work Road, St Ola, Kirkwall, Orkney, KW15 1UF. email: orklander45@gmail.com, Tel: 01856 872468. Fair Isle: Nick Riddiford, Schoolton, Fair Isle, Shetland, ZE2 9JU. email: nick.riddiford@lineone.net, Tel: 01595 760250.